You can see my bike and run GPS data from there race here: http://connect.garmin.com/activity/32442040. Lap 1 is the bike, the rest of the laps are mile (in some cases 2 or 3) splits. The course is hard. The swim was around 60 degrees and could easily be +/- 5 degrees in future races. The bike was as advertised containing over 6,000 feet of climbing. Even for a well trained age grouper a 112 mile ride covering 6K of climbing is a challenging training ride, let alone something you’d do in a race. Show of hands of who has run 26.2 miles after 6K of climbing over 112 miles?? Right, not many of us and for good reason because it’s hard! Top this off with constant wind and long stretches of chip seal paving and the ride is less than pleasant. The run serves up 2,300 feet of elevation gain. By itself, it’s doable, but after the bike it’s quite challenging. The course is almost never flat and in many places is very steep going up or down. Even with proper pacing on the bike, the run is going to hurt, there is no escaping it and all but the very elite will suffer mightily. But we are there to suffer, right? Of course, so that doesn’t bother me. While the elevation gain is a bit daunting, that’s not really what will make the course hard. The wind….oh the wind. On race day we were lucky and winds were moderate but on the days prior and after they were gusting to the point that I’d rather not race at all. The screaming descent at the end of each loop would be very dangerous in the wind and between that and the chip seal you’d have a pretty miserable 5-8 hour white knuckled vibrating experience. Even with moderate winds like we had there were times where it felt a bit like being in a washing machine as winds quickly changed directions on you back and forth making it hard to get into a rhythm. The location of the race is amazing. 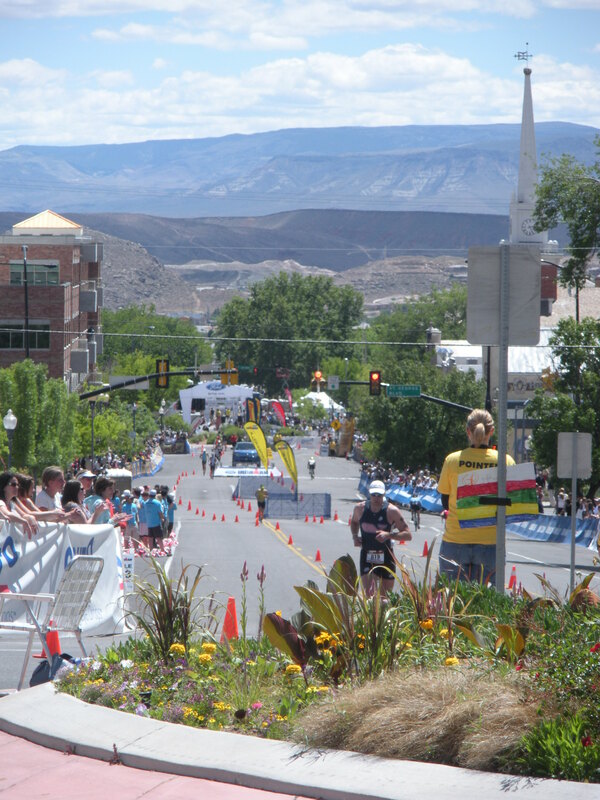 You won’t find better scenery at any Ironman race in North America. I’ve never done Canada but I’d say this was hands down better scenery than even a place like Lake Placid. The bike offers views as far as the eye can see with a mix of red dessert sand and distant snowcapped peaks. The people of St. George were the best hosts I have ever experienced. I must have had my picture take at least 30 times by spectators who were completely in awe of every single racer, even a shmoe like me. They were completely enthusiastic. Even at a wonderful venue like Lake Placid, there is a “been there done that” sense among the locals, but here these guys were wide-eyed and possibly even more excited than I was for the race. As for the race production, it was flawless which is amazing for a first time race with two transitions no less. My only complaint was that they did body marking (using stencils and special ink) at registration. So I stood in one like for 30 minutes and it turns out that that was only for the upper body. I had to then go stand in another line for 30 minutes to get my age on my calf. But beyond that, it came across like a race that had been running forever. Overall for me personally I probably won’t do this race because of the variability in the weather and the implications it could have on the race. We lucked out with good conditions but I still wasted a lot of mental energy over the potential cold water, gusting winds, cold descents, etc. I’d rather just focus more on swim, bike, run than neoprene caps or whether I need booties on the bike or not. While the town is great, the location is beautiful and the course is challenging , I’m just not sure I’d want my training to be undermined by factors beyond simply swimming, biking and running. But some people love that stuff and if you’re one of those people….stop reading this and go sign up! Canada is “on the list”.